It is a requirement that all government related websites meet section 508 accessibility guidelines, and your business website should as well. Accessibility is a right, not a privilege. Common visual problems are due to cataracts, glaucoma, age-related macular degeneration, corneal opacity, diabetic retinopathy, childhood blindness, trachoma and onchocerclasis. Since people with visual disabilities can’t actually view your website they need to utilize assistive technologies(AT). A common screen reader for windows is JAWS (not the shark). JAWS is an acronym for Job Access with Speech. JAWS used a virtual cursor when interacting with web content. Way back in the later part of the 1990’s I took a web design class at Wake Tech focusing on HTML coding. I remember the instructor was site impaired and stressed how important accessibility was and that it should not be ignored when developing a website. 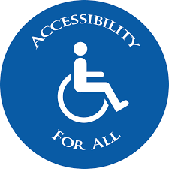 I have not forgotten that and accessibility is very important to me and I wanted to learn as much as I could in regards to website accessibility. I have taken measures to make my website, Inspired-Evolution.com to be accessible. This is still a work in progress, but for the site I made sure I develop using semantic HTML markup, aria roles, alt text and best practices for HTML table accessibility.. Some of my favorite tools to test for web site accessibility are the HTML5 Validator, CSS3 Validator, Chrome Vox, and Chrome Accessibility Developer Tool. Accessibility should not be a privilege, it should be a right for those to be able to access websites just as those without disabilities can access digital content. Currently many websites are breaking the law, by not being accessible. This is not ok, and those that develop and maintain websites should be better informed into how to ensure their websites meet accessibility guidelines. Hopefully, this blog post will help. Next Give your website a face-lift and checkup in 2017!